The opera is in three acts and takes place at the home of Stanley and Stella Kowalski at Elysian Fields, New Orleans. Blanche DuBois has suffered the loss of both her ancestral home and her job when she arrives in New Orleans to visit her sister Stella, who has married Stanley Kowalski, an ex-G.I. trucker. Stanley, infuriated by Blanche's artificial airs, her suggestive behavior, and what he regards as her loss of his wife's birthright, is determined to expose Blanche's lies about her past-which is more tragic and sordid than he is able to imagine. During a poker game Blanche meets Harold Mitchell (Mitch), a workmate of Stanley's, very much tied to his mother's apron strings. Blanche sets her sights on him. Stanley, drunk, breaks up the evening and strikes Stella, whom he regards as siding against him with Blanche. After this violence, and against Blanche's advice, Stella returns to Stanley's bed. The next morning Stanley overhears Blanche entreating her sister to leave him. Stanley tells Stella that he has a friend who is making inquiries about Blanche in her hometown of Laurel. When he and his now-pregnant wife go out for the evening, Blanche attempts to seduce a young paper boy, pulling back at the last minute. She later goes out with Mitch on a date. An amorous Mitch unburdens his heart to Blanche, who in turn tells him of her brief marriage to a young homosexual and how she blames herself for his suicide. Mitch is late for the party. Stanley, who feels that his home and marriage are both threatened by Blanche, breaks up the celebration when he reveals that his friend has discovered Blanche's unsavory reputation in Laurel for seducing young men, and the fact that she had been told to leave town. He hands Blanche a one-way ticket back home and tells her that Mitch now knows everything and will not be coming around again. Thus begins the fragmentation of Blanche's mind. Stella has been taken to a hospital for a premature delivery. Mitch, drunk, invades the apartment and bitterly reproaches Blanche: just as her desperate hopes lie with him, his had lain with her. They have both lost their emotional refuge. His denunciation of her as someone too unclean to enter his mother's house and the appearance of a Mexican woman selling flowers for the dead are the triggers that start to unhinge Blanche's mind. Blanche's fragmentation is completed when Stanley rapes her. Blanche prepares to leave for a visit to a fictitious old admirer. In fact Stella, unable to believe in Blanche's accusations against Stanley, is packing Blanche's clothes for her to take to the asylum when the doctor arrives. Now she depends  in a new way  on "the kindness of strangers." Australian Premiere***** Bruce Beresford, stage director Opera Australia/Tom Woods 2 August 2007; Sydney Opera House, Sydney, Australia One of the most talked-about operas ...from the US is A Streetcar Named Desire, composed by Andre Previn with libretto by Philip Littell, based on the famous Tennessee Williams play of the same name. The new Opera Australia production based on the 1998 premier season in San Francisco opened at the Opera House on Thursday, and it was a sobering night for opera-goers. The storyline is based on the tortured lives of a group of family, friends and lovers in the New Orleans of the 1930s. The emotions drawn out in this uncomfortable unfolding of a near-contemporary tragedy are raw in the extreme, and the principals deserve high praise for their performances... The movie-making background of director Bruce Beresford is evident in the stage effects of this production, with revolving sets revealing various interiors of the Kowalski home, with a dramatic vaporising mist giving a surreal hazy dream-like allusion to the emotional rollercoaster lives of the characters within. Previn's "Streetcar" is a rare hit among contemporary operas. [In its] UK premiere, André Previn's operatic version of A STREETCAR NAMED DESIRE [was presented] with several of the original cast appearing alongside the excellent London Symphony Orchestra for a riveting semi-staged performance under the composer's direction. The opera (which uses a scrupulously faithful libretto by Philip Littell) has superbly crafted, full-blooded set pieces. There are luscious arias for Blanche, confrontations both savage and meltingly tender, and moody orchestral interludes evoking smoldering lusts. But just as important, Previn displays a confidence in the power of pure lyricism to carry raw emotion that has not been apparent in opera since Britten's day. ...It is certainly Previn's finest work and that [should] tempt you to ride this STREETCAR. [Previn's] work, with librettist Philip Littell, preserves the essential power of Tennessee Williams' play, at the same time it offers vocal set pieces that have claims to inevitability and long life. When Previn came out to bow ... he and Fleming seemed shy about sharing the enthusiastic applause. Yet they, and director Colin Graham and this stylish cast, had put onstage a work that will have to be considered in any appraisal of opera's grand march to the millennium. A great play has become a thrilling opera....a tour de force mix of drama and music, set design and casting, language and poetics. There is an appropriate musical gravity, with a bluesy feel and a nervous undertone that serves the story well. Occasionally, the score recalls the onetime modernism of Stravinsky. The orchestral sequences of the opera are quite wonderful  full of creative motifs cast into fresh orchestrations and all the while pulsing with the heated passions and conflicting pathos of Williams' tale. Previn's theatrical instincts are put to good use in his score, which always underlines the dramatic situation and fits the prosody of the words superbly. Fleming is nothing short of magnificent as Blanche - golden-age singing combined with dramatic gifts that the old-time singers never even tried for. Previn's score, which he conducted himself, is never less than fluent, responsive to the drama and sensitively written for the voice. It is clear from the uncommon involvement of the audience that Previn has created a viable opera; repeated listening makes it also clear that the music does not merely piggyback on the success of the play but creates its own hypnotically engaging world. ...it is skillful music, intelligent, responsive, sensitive, and atmospheric  you can hear the heat rising from the pavement. With its recurring hints of New Orleans jazz and restless but soft-edged vocal line, Previn's music deftly reflects the highly charged atmosphere full of yearning and regret. Librettist Philip Littell shapes Williams' words with equal care. Arias and duets rise naturally from the story line. Where Previn's musicianship shows most clearly is in his writing for voices  every word of the text was audible. A Streetcar Named Desire, born at the end of the century, will remain one of the absolute masterpieces of the last fifty years. ...He [Previn] writes great streetcar music and great music of desire. A powerful train-whistle motif in the orchestra opens the opera and recurs at important moments. The love music between Stanley and Stella, particularly Stella's  languid, smoldering, passionate, rapturous, raw, real  does exactly what music should do for an opera. It reveals why people feel the way that they do. No explanation is necessary. The most widely discussed...new opera in recent years [came] to television in a "Great Performances" presentation on PBS. André Previn's operatic version of "A Streetcar Named Desire" fills the television screen with melodrama, florid text, touching poetry and lyrical power. "Streetcar" makes for wonderful lyric theater and can grip audiences with the added depth only music can provide. What makes this Streetcar so worthwhile is the music.... The score ranges from angry dissonance to romantic lyricism. Streetcar is rich with color, by turns lush, frantic, heartbreaking, even funny.... Though the score has no outright jazz, there are moments of real jazziness: this is, after all, New Orleans. The clunky moments -- notably, when the nurse and doctor take Blanche away -- are offset by some fine ones. Though 20th century operas tend to be short on arias, Streetcar includes two showstoppers for Blanche. 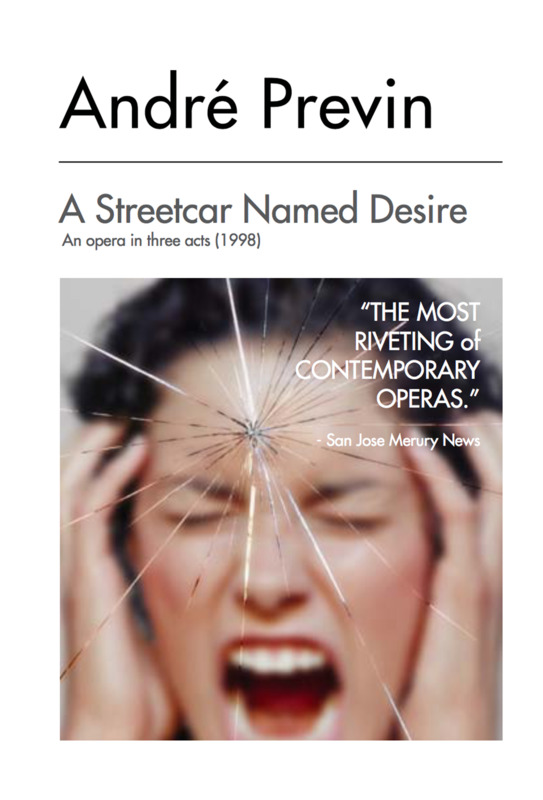 In André Previn's opera A Streetcar Named Desire, the San Francisco Opera has commissioned a genuine and wholly accessible hit, one sure to remain in the repertory of the world's opera companies for a great many years. Previn writes superbly for the voice, crafting brutal, neurotic or lyrically lilting lines that make almost every word intelligible. Those words, almost all of which are Williams's, are set as inflected recitative, accented like normal speech, distinct for each character. Previn makes use of leaps in tone or volume, repetitions or ominous orchestral echoes to communicate heightened emotion, but never breaks the link with naturalistic communication. The big question, of course, is whether a work as exquisitely, even as preciously wrought as Tennessee Williams's play needed, wanted or could be helped by the addition of music, beyond the mood music that the playwright himself asked for in his stage directions. In the orchestra, Previn maintains a respectful reticence behind the voices. At the same time the worrisome, ominous emotions it expresses convey a great deal of the violent, unspoken subtext. The score sounds genuinely contemporary...the play of instrumental colors is exciting; the overlay of blues and the pop idioms creates an overall sound of urban America. Theater-trained, dramatically astute composers [are] careful to shape the overall dynamics of their scores so that one feels and suffers the increasing entrapment of a genuinely tragic plot. Previn's vocalizing of pain is superb...in each instance, the sung music remains lucid, appropriate, even passionate. A Streetcar Named Desire is the best new opera I have seen and heard since Britten's Death in Venice 25 years ago. In its remarkable faithfulness to the emotional tensions of the original, its richly textured, all-American score and its dedication to singable, intelligible vocal lines that are at once contemporary, pleasing to the ear and keenly in character, it marks a uniquely successful venture in the broad field of popular American music drama. ...Previn and libretist Philip Littell have done a splendid job of distilling the essence of Streetcar and transforming it into an opera that sings. Two arias in Act III are showpieces that place Blanche squarely on the fringes of sanity. The first, "I want magic," already has been extracted as a concert aria, but it is the second aria, "I can smell the sea air," that exudes time-stopping rapture, recalling the farewell-to-life transcendence pervading Strauss' "Four Last Songs." Previn leads the San Francisco Opera in what sounds like a definitive performance of his first, impressive plunge into the operatic art. May there be more.